"How much richer it is to measure, evaluate, and treasure your life not just in the dry numbers of mechanical clocks and paper calendars but also in the multifarious moving lights in the sky and their interrelations." The planets each have their own movement, brightness and colour characteristics. The ancient Greeks referred to them as 'planetes asteres' ('wandering stars') from which the word 'planet' is derived. The planets undergo a regular appearance cycle and several of them can be seen with the naked eye for much of the year, apart from short periods of time when they are too close to the Sun to observe. The planets can be distinguished from the stars because they change their position slightly against the background stars from one night to the next, and their brightness varies in a regular cycle over a period of time. The changing positions of the planets which are closest to the Earth - i.e. Mercury, Venus and Mars - can be followed easily with the naked eye over only a matter of days. The motion of the more distant planets against the stars can be seen with the naked eye over longer periods of time, although a pair of binoculars will help to reveal their motion over a much shorter time span. Wand'rin' Star: Mars and the Twins, 2007-8 (click on the image for the full-size animation). 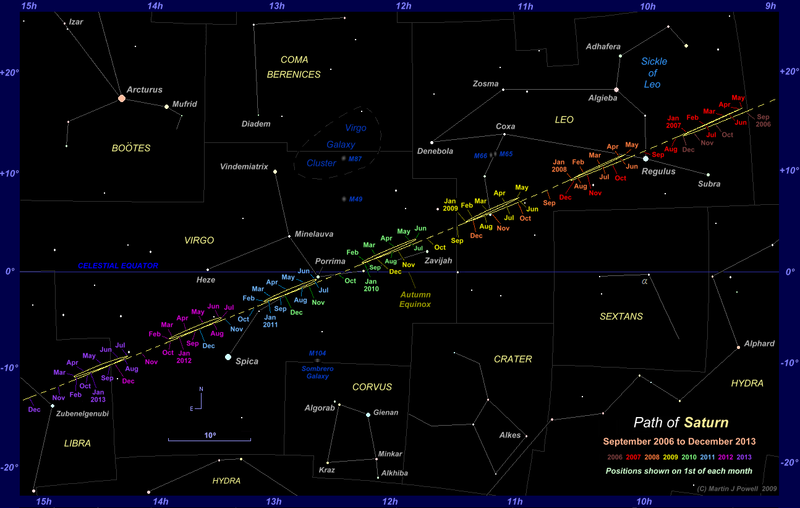 The path of Mars against the stars of Gemini from late 2007 into 2008, shown at 15-day intervals. Mars described a typical 'looping' formation during this time (a full-size starmap, also showing the surrounding constellations, can be seen here). At its previous close approach to the Earth in 2005-6, the planet performed a zigzag formation in the constellation of Aries. To see what causes the planets to loop in the night sky, see the animation below. In addition to their shifting positions against the background stars, the brighter planets also do not appear to twinkle (or scintillate) as readily as the stars. Rather, when they are well above the horizon, the planets shine with a more steady light. The Sun, Moon and planets are seen to move along a fairly narrow band of the night sky which passes through the twelve commonly-known zodiac constellations - namely Pisces (the Fishes), Aries (the Ram), Taurus (the Bull), Gemini (the Twins), Cancer (the Crab), Leo (the Lion), Virgo (the Virgin), Libra (the Balance or Scales), Scorpius (or Scorpio, the Scorpion), Sagittarius (the Archer), Capricornus (or Capricorn, the Sea-Goat) and Aquarius (the Water Carrier). In addition, the Sun, Moon and planets also move through a thirteenth, lesser-known constellation - Ophiuchus (the Serpent-Holder), the Southernmost part of which lies between Scorpius and Sagittarius. Any bright 'star' which is seen in any of these thirteen constellations that does not appear on a star chart is very probably a planet. The name zodiac derives from the ancient Greek term 'zoidiakos kyklos' - the 'circle of animals' - which these twelve constellations represent (apart from Libra, that is, whose stars originally formed 'the claws' of the Scorpion; the Romans later separated these stars from Scorpius and re-named them Libra). Viewed from the orbiting Earth, the Sun appears to move against the background stars, i.e. the stars which form the twelve zodiac constellations and Ophiuchus. The apparent path along which the Sun moves during the year is called the ecliptic (from the ancient Greek term 'ekleiptikos', meaning 'the path along which eclipses occur'). If we were able to stand at the centre of the Sun (!) and observe the Earth orbiting around us, we would see that, throughout the course of its orbit, the Earth described a path against the background zodiac constellations - the same path that we see the Sun describe, but viewed from the opposite direction. Therefore, as well as being the Sun's apparent path against the background stars, the ecliptic can also be considered as the plane of the Earth's orbit projected out into space. The Naked-eye Planets in Motion The Sun and the five brightest naked-eye planets are shown here in continuous motion from January 2000 to December 2015 (a star map identifying the constellations is shown below). The 'invisible path' along which the Sun appears to move - and which the Moon and planets follow very closely - is known as the ecliptic (indicated by the curved yellow line in the star map below). Note from the animation how the inferior planets (Mercury and Venus) always remain within a limited angular distance of the Sun, their positions swiftly alternating between East and West of it (i.e. between evening and morning appearances). The superior planets (i.e. from Mars outwards) move well clear of the Sun (up to 180� away) and describe looping motions at angular speeds which are determined by the planet's orbital distance from the Sun; hence Mars moves steadily through the constellations whilst Saturn seems to move at a snail's pace. The overlay grid marks intervals of 10� in celestial longitude and latitude. The animation was produced (and is kindly made available for public use) by David Colarusso (note that the animation requires the Shockwave Flash Player plug-in to display correctly). Star map of the constellation patterns in the above 'planets in motion' graphic, showing the ecliptic and the celestial equator (move your cursor over the image - or click on the image - to reveal the constellation names in their abbreviated three-letter form - the full names are listed here). Zodiac constellations are labelled in green and non-zodiac constellations in grey. The significant solar positions marked on the chart apply to the Northern hemisphere and are as follows: VE = Vernal (Spring) Equinox, SS = Summer Solstice, AE = Autumnal Equinox and WS = Winter Solstice. In the night sky, the ecliptic is shaped like a sine wave with its most Northerly point in Eastern Taurus (i.e. at the Northern hemisphere summer solstice point) and its most Southerly point in Sagittarius (at the Northern hemisphere winter solstice point). Hence from the Northern hemisphere, Taurus and Gemini will be the highest zodiac constellations in the sky and Sagittarius will be the lowest zodiac constellation in the sky (the reverse is true for Southern hemisphere observers). For any given location on Earth, the Sun's sinusoidal path through the constellations (brought about by the tilt of the Earth's axis in space) causes the Sun's rising and setting directions on the local horizon to change throughout the year. Hence the length of the local day and night varies throughout the year, giving rise to the seasons. The numbers along the sides of the chart (Right Ascension and Declination) are co-ordinates of celestial longitude and latitude which astronomers use to locate the position of a celestial body in the night sky. Whilst the Sun's apparent movement defines the line of the ecliptic, the Moon and planets do not strictly follow this line for two reasons: (a) their orbits are inclined at slightly differing angles to the ecliptic (this is referred to as their orbital inclination, which is measured from the Sun's centre - see the Orbital Data Table below for details) and (b) the effect of the planet's parallax as seen from the Earth at any given moment. For much of the time, the planets deviate above or below the ecliptic by only a few degrees during the course of their orbit (this is referred to as the ecliptic latitude). Venus and Mars deviate by greater amounts because they come closer to the Earth than the other planets and are therefore subject to greater parallax. Venus moves up to 8�� to the North of the ecliptic and up to 8� to the South of it, whilst Mars moves up to 4�� to the North of the ecliptic and up to 6�� to the South of it. These planets' highest deviations take place around inferior conjunction (see below) in the case of Venus and around opposition (see below) in the case of Mars. Of the other naked-eye planets, Mercury moves up to 3�� to the North of the ecliptic and up to 5� to the South of it; again, these extremes take place around the time of the planet's inferior conjunction. Jupiter moves within a band of �1�.6 of the ecliptic and Saturn within �2�.8 of it, these maximums happening around opposition time. The Moon's orbit is inclined to the ecliptic by a significant angle of 5�.1, however it is so close to the Earth that parallax can push its apparent deviation against the background stars by up to 0�.9 more. It is for this reason that solar eclipses do not take place at every New Moon. For most months in the year, the Moon's high inclination causes it to move a few degrees to the North or South of the Sun at New Moon, rather than directly across it (as takes place less often, during a solar eclipse). Consequently, the planets and the Moon do occasionally wander into adjacent non-zodiacal constellations (e.g. Cetus, Orion, Sextans) for short periods of time. The Sun's Annual Motion through the Zodiac Constellations (click on the image for a full-size zodiac strip). The Sun's position is shown at five day intervals along the ecliptic;, shown here referred to the plane of the ecliptic (i.e. it appears as a straight line). The points of the solstices and the equinoxes (for the Northern hemisphere) are also marked. The Sun moves Eastwards through the zodiac constellations at a rate of just under 1� per day (although of course it is the Earth's own motion through its orbit - and not the Sun - which causes this apparent motion). The Sun's exact position on a particular day over any given four-year period can vary by up to 0�.75 because of the inexact number of days in the Earth's year; this is of course corrected - at four yearly intervals - by the insertion of a leap day at the end of February. Most of the time, the planets will be found within a band about 3� above and below the ecliptic (marked at both ends of the zodiac strip with +3 and -3). A Southern hemisphere view of the zodiac, showing the antipodean solstice and equinox points, can be seen here. The length of time a planet is visible on any given night - or whether it is visible at all - depends upon the relative orbital positions of the planet and the Earth with respect to the Sun on that particular night. The duration of twilight at the observer's location is also an important factor because, of course, if the sky is too light the planet will not be visible! Note that the inferior planets are often referred to as the inner or interior planets, whilst the superior planets are often referred to as the outer or exterior planets. However, the expression inner planet is generally taken to mean the terrestrial planets Mercury, Venus, Earth and Mars, i.e. those which lie closer to the Sun than the asteroid belt. Similarly the expression outer planet is taken to mean the gaseous planets beyond Mars, i.e. Jupiter, Saturn, Uranus and Neptune. Viewed from the orbiting Earth, the planets undergo a regular appearance cycle - known as an apparition - over a given period of time. A planet's apparition begins when it emerges from the glare of the Sun, becoming visible in the twilight after a short period of invisibility (when the planet passed in front of - or behind - the Sun). An apparition ends when the planet disappears into the glare of the Sun, becoming lost in the twilight after a significant period of visibility. The precise nature of a planet's apparition depends upon whether it is an inferior planet (orbiting closer to the Sun than the Earth, i.e. Mercury and Venus) or a superior planet (orbiting further out than the Earth, i.e. Mars and beyond). The visibility cycles of these two types of planet will now be explained. Because the orbits of the inferior planets are contained within the Earth's orbit, they can only appear within a limited angular distance (or solar elongation) from the Sun. As a result, they are only visible for a limited period of time, either before sunrise or after sunset. Therefore, they can never be seen opposite each other in the sky (i.e. 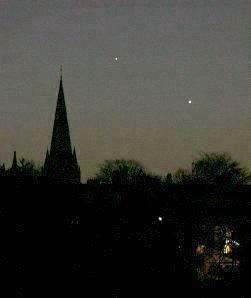 Venus rising whilst Mercury is setting, or vice versa). Similarly, Mercury and Venus can never be seen on or near the observer's meridian (see text box at right of page) at local midnight, except when observed from polar latitudes. Both of these scenarios are quite unlike those of the superior planets, which are often seen rising whilst another is setting, and which are often seen on/near the meridian at midnight. It is however worth mentioning that Venus can sometimes be seen near the meridian in daylight when it is a safe distance away from the Sun in the sky (see photograph). The meridian is an imaginary line which passes from North to South through a point directly above the observer's head (see diagram). A celestial body reaches its highest point in the sky when it crosses the meridian; this is known as the moment of transit or culmination. Mercury's maximum solar elongation (called simply the greatest elongation) varies between 18� and 28�; for Venus, it varies between 45� and 47� (the greater variation in Mercury's elongation distance is a consequence of its eccentric orbit). A planet's solar elongation is normally referred to as being either East or West of the Sun; East of the Sun for Evening appearances and West of the Sun for Morning appearances. As a general rule-of-thumb, a planet cannot normally be seen when its elongation is less than about 15� from the Sun. The appearance cycle of an inferior planet is as follows. The planet first passes between the Earth and the Sun, at a point called inferior conjunction. The planet cannot be seen from the Earth at this time, nor for about a week on either side of it. Seen from the Earth, the planet usually passes slightly to the North or South of the Sun, but on rare occasions an inferior planet can pass directly in front of the Sun in an event known as a transit. On these occasions, when using safe solar filters or telescopic projection, the planet can be seen as a small black dot moving slowly across the Sun's disk. Transits of Mercury always take place in November or May; the last one took place on May 9th 2016 and the next will be on November 11th 2019. Transits of Venus are much rarer and they always take place in early June or early December; the last was on June 5th-6th 2012 and the next one will be on December 11th 2117. Morning Stars (click on the image for the full picture) When bright planets pass each other in the sky (an event known as a planetary conjunction) it can be quite a spectacular event. This particular pairing - of Mercury and Venus - took place during the early morning hours from late December 2004 to early January 2005. 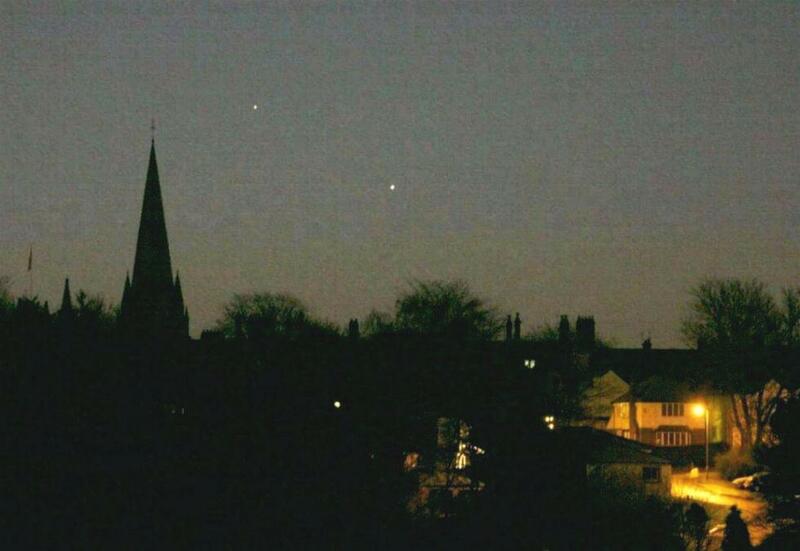 Venus is the lowest (and brightest) of the two planets in this picture. Following inferior conjunction, the planet emerges in the dawn sky as a 'morning star', rising shortly before the Sun. Seen through a telescope, the planet appears as a large crescent, facing Eastward to the Sun below the horizon. The planet moves further away from the Sun as each day passes (i.e. its solar elongation slowly increases westwards) and the planet gradually brightens as it does so. Telescopes show a shrinking but thickening crescent during this period, as the planet slowly recedes from the Earth in space. Eventually the planet reaches its greatest Western elongation. When Mercury reaches this point in its orbit - and depending upon the observer's latitude - it rises up to an hour (and sometimes up to 1� hours) before sunrise; when Venus reaches this point, it rises around three hours before sunrise. Mercury brightens all the way through to greatest elongation, but Venus shines at its greatest brilliance (maximum apparent magnitude) when it reaches a point about 40� West of the Sun, when its apparent size (its angular size when seen from the Earth) and its phase - a 28% illuminated crescent - combine to best effect. Venus then dims slightly as it approaches greatest elongation, but it remains brilliant nonetheless. At greatest western elongation both planets show an Eastward-facing half-phase (a 50% illuminated disk) through telescopes (in theory, the dates on which an inferior planet reaches greatest elongation and when it appears half-phase should coincide, however they frequently do not because of eccentricities in the planetary orbits). After greatest western elongation, the planet slowly begins to move back in towards the Sun (its solar elongation slowly decreases). The telescopic view changes to a gibbous phase (i.e. greater than half but less than full illumination), the planet's apparent size shrinking as it recedes further from the Earth. Mercury continues to brighten but Venus continues to fade slightly, both planets becoming increasingly difficult to see in the morning twilight. The planet then disappears from view and passes behind the Sun, reaching a point called superior conjunction; Mercury cannot be seen from the Earth for a couple of weeks - and Venus for several weeks - on either side of superior conjunction. Our inferior planet then re-emerges in the evening sky as an 'evening star', setting shortly after the Sun and moving further away from it as each day passes (solar elongation increasing eastwards). Through a telescope, the appearance of an inferior planet during an evening apparition plays out in the reverse order to that of its morning apparition; it emerges in the evening sky as a small gibbous phase, slowly increasing in apparent size as the planet approaches the Earth in space. Mercury slowly dims during this period but Venus brightens, both planets eventually reaching their greatest Eastern elongation. Depending upon the observer's latitude, Mercury then sets up to an hour (and sometimes up to 1� hours) after sunset; Venus sets around three hours after sunset. At greatest eastern elongation both planets show a Westward-facing half-phase through telescopes. The planet then moves back in towards the Sun, Mercury fading and Venus brightening, the latter reaching its second greatest brilliancy point at around 40� East of the Sun, after which it slightly fades. The telescopic view during this time is that of an enlarging and thinning crescent. Our inferior planet then sinks into the evening twilight and becomes lost from view. Soon afterwards it returns to inferior conjunction and the cycle begins again. Note that Venus is brightest when it is on the near side of its orbit to the Earth, at a point on either side of inferior conjunction when it shows a crescent phase. Mercury, on the other hand, is brightest on the far side of its orbit - shortly before and after superior conjunction - when it shows a gibbous phase. Paradoxically, when Mercury is brightest it is virtually impossible to see, because it is then so close to the Sun. The brightness of Mercury as seen from the Earth can vary by some six magnitudes throughout its orbit - this is the greatest variation in apparent visual magnitude of any of the Solar System planets. However, this brightness variation is not seen to best effect because of the planet's continuously twilit backdrop and its proximity to the Sun. During the course of a Venus apparition, a telescopic observer will see the planet's appearance vary from a small gibbous phase - with an apparent equatorial diameter of around 10 arcseconds (10") across - to a large crescent phase around 55 arcseconds (55") across. This large variation in apparent diameter (second only to Mars) is primarily because Venus comes closer to the Earth in space than any of the planets (a list showing the variation in apparent sizes of the planets is given in the Orbital Data Table below). Simulated 'live' views of Venus through a telescope can be seen in the accompanying article 'Venus through the Telescope'. Aspects of the Inferior Planets (move your pointer over the image to start the animation, or click on the image). Animation showing a complete cycle of inferior planet aspects from one inferior conjunction to the next (i.e. one synodic period). The animation is viewed from a point in space above the Earth's North pole and moves along with the Earth in its orbit. The blue line marks a fixed point in space at which the two planets are initially in alignment (in this case, at inferior conjunction). Note that all the major planets revolve around the Sun in an anti-clockwise sense when seen from above the Earth's North pole. The number of days elapsed (since inferior conjunction) apply specifically to Venus; note that by the time Venus reaches inferior conjunction for the second time, the Earth has completed just over 1� orbits - hence the synodic period of 584 days. The orbits are not shown to scale. All of the elements described above regarding the visibility cycle of an inferior planet are brought together in the form of an animation (see below) showing a typical evening apparition of Venus, seen from the perspective of an Earthbound naked-eye/telescopic observer. The length of time elapsed between one inferior conjunction and the next inferior conjunction (one complete appearance cycle) is about 116 days (16� weeks) for Mercury and 584 days (just over 1� years) for Venus. The time elapsed between any two of the same planetary aspects (or configurations) when seen from the Earth is called the synodic period; these periods are listed for all of the planets in the Orbital Data Table below. The visibility of an inferior planet from any given location on Earth is heavily dependent upon its brightness, the observer's latitude and the season in which the planet is observed. As previously mentioned, the length of local twilight is one factor, but equally important is the angle of the ecliptic to the observer's horizon at the point where the planet is rising (morning sky) or setting (evening sky). The ecliptic can be envisaged as a 'celestial highway'; a giant, invisible sinusoidal curve in the sky, only about half of which is above the observer's horizon at any given time. Its most Northerly point is in Gemini and its most Southerly point is directly opposite, in Sagittarius; at these points, the ecliptic 'flattens out' as the sinusoidal curve reaches its upper and lower limits (i.e. at the Sun's midsummer and midwinter positions). The ecliptic is inclined to the celestial equator at an angle of 23�.5 (this is known as the obliquity of the ecliptic) and in the night sky this angle is most evident where it cuts across the celestial equator. This happens at two points along the ecliptic: near the head of Pisces (where the Sun heads Northwards at the Vernal equinox) and at the opposite side of the sky near the head of Virgo (where the Sun heads Southwards at the Autumnal equinox). Animation showing a typical evening apparition of Venus, with the planet plotted at 15-day intervals for a time 45 minutes after local sunset. This particular apparition took place between November 2003 and June 2004. Greatest elongation (46� East of the Sun) took place on March 29th 2004, when the planet showed a half-phase through telescopes. The 2003-4 apparition ended with a transit of Venus (when the planet crossed the face of the Sun) on June 8th 2004. Viewed from the Earth, the apparent size of Venus typically ranges from just 10" (i.e. 10 arcseconds, at superior conjunction) to about 60" (60 arcseconds, or 1 minute of arc, at inferior conjunction). In the animation, Venus' apparent size varies from 11".4 (on November 30th 2003) to 55" (on May 28th 2004). The apparent magnitude of the planet varies from -3.8 (on November 30th 2003) to -4.1 (on May 28th 2004). Greatest brilliancy (-4.4) was reached in early May. The animation applies to a latitude of 52� North (applicable to Northern Europe, Canada, Russia). The numbers shown in grey on the left (10�, 20� and 30�) indicate the angular elevation or altitude (i.e. the angle above the horizon) of any given celestial body for that particular latitude; hence on January 29th 2004, some 45 minutes after sunset, Venus was in the South-west at about 23� above the horizon. The changing brightness of the sky reflects the changing length of twilight as the seasons progress from Winter to Spring to Summer in the Northern hemisphere. Note the extent of the horizon covered by Venus during the course of its apparition, as the planet follows the changing position of the setting Sun through the year; the illuminated section of the planet faces towards the Sun, which, at the dates and times shown, is several degrees below the horizon. The inset telescope view shows the changing apparent size and phases of the planet (it is a true, 'upright' view through a telescope, however most astronomical telescopes will show an inverted image). Selected bright stars shown are Algenib (in Pegasus), Hamal (in Aries), Pleiades, Aldebaran and Al Nath (in Taurus), Alhena (in Gemini) and Betelgeuse (in Orion). The orbital periods of Venus and the Earth are related such that 13 Venusian years (13 x 224.7 days = 2921 days) are approximately equal to 8 Earth years (8 x 365.25 days = 2922 days). Hence, when seen from the Earth, Venus appears in very nearly the same position in the sky at any given 8-year interval. The evening apparition shown here therefore repeated, to within a couple of days, between November 2011 and June 2012 (when another transit of Venus took place). Transits do not occur every 8 years, however, since the relationship between the two orbits is not an exact one. After 2012, there will be no Venus transits until the year 2117. During the course of each 8-year period, Venus undergoes five morning apparitions and five evening apparitions. For a more detailed explanation of the Venus 8-year cycle, see the Naked-eye Venus page. Consequently, the ecliptic presents a variety of angles to the local horizon at its rising or setting point, depending upon the observer's latitude, the time of day and the season of the year. If Mercury or Venus is positioned in a constellation in which the ecliptic presents a shallow angle to the horizon when it is rising or setting, the planet will be very low down in the twilight and it will only be visible for a short while (if it is visible at all). On the other hand, a steep ecliptic angle to the horizon means the planet will be seen higher up in the twilight, resulting in a longer period of visibility. Hence an inferior planet, even when it reaches greatest elongation, can appear low down in the twilight in certain seasons, but high up in other seasons, either before sunrise or after sunset. Mercury Rising Showing how the visibility of the innermost planet is strongly affected by latitude and local season. The diagrams show the morning sky facing Eastwards at a Northern and Southern hemisphere latitude in mid-April (Spring in the Northern hemisphere, Autumn in the Southern hemisphere). The Sun is about 6� below the horizon, so that the sky brightness is the same at both latitudes. Mercury is shown near greatest Western elongation, positioned slightly South of the ecliptic in Southern Pisces (none of the stars of the constellation are visible because of the twilight). 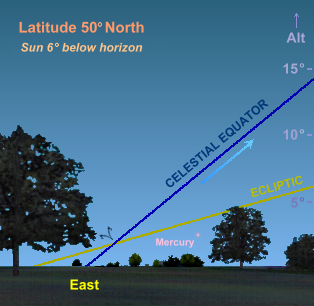 At latitude 50� North, about 36 minutes before sunrise, the shallow angle of the ecliptic to the horizon causes Mercury to languish low in the sky, around 2� in altitude. It is barely detectable in the bright twilight and is caught in the haze near the horizon. The planet has only been above the horizon for about 15 minutes. 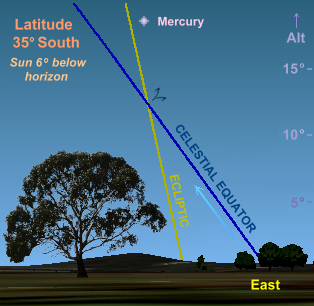 At latitude 35� South, about 26 minutes before sunrise, the steep angle of the ecliptic relative to the horizon ensures that Mercury appears high in the sky (around 18� in altitude), easily detectable against a darker sky. The planet has already been above the horizon for about an hour and a half. In both diagrams, the rising direction of the stars and planets are indicated by an arrow (celestial bodies move across the sky from East to West in a direction which is parallel with the celestial equator). The angle of the celestial equator to the local horizon remains fixed throughout the year (this is determined by the observer's latitude) however the angle of the ecliptic against the local horizon varies throughout the day and across the seasons; this variation applies at both Eastern and Western horizons. Hence for any given latitude, Mercury can be better seen in some seasons than others. Mercury is particularly prone to visibility problems in this respect, since it is never very far from the Sun. It typically makes three morning appearances and three evening appearances each year, though for any given location on Earth, the planet will only be well placed for viewing on about half of these occasions. Northern Hemisphere observers have their best views of Mercury on March/April evenings and September/October mornings; Southern Hemisphere observers get their best views on September/October evenings and March/April mornings. In fact, the relationship of Mercury's eccentric orbit to that of the Earth's is such that the planet's most favourable elongations (~28� from the Sun) are best seen from the Southern hemisphere. Venus is not subject to such hemispheric favouritism since its orbit is very nearly circular (it has the least eccentric orbit of all the planets) and its solar elongations are much greater than those of Mercury; hence both hemispheres have a more or less equal chance to observe the Goddess at her best. The superior planets, unlike the inferior planets, can appear at any angular distance from the Sun (up to 180� away) so they are often visible for much of the night. The yearly cycle of a superior planet is as follows. After passing behind the Sun (at superior conjunction, at which time it is not visible) the planet emerges in the dawn sky as a 'morning star', rising shortly before sunrise. It slowly moves away from the Sun, the planet rising earlier and earlier on each successive day (typically, several minutes earlier each day) its solar elongation slowly increasing westwards. Rising well after local midnight, it becomes visible into the early hours of the morning. When it reaches a point 90� West of the Sun called Western quadrature (solar elongation = 90� West), the planet rises around local midnight. It continues to rise earlier each day and eventually reaches a point called opposition, when it is directly opposite the Sun in the sky (solar elongation = 180�). It is then visible all night long, rising opposite the Sun around sunset and setting opposite the Sun around sunrise. In the Northern Hemisphere, the planet is seen due South around local midnight; in the Southern Hemisphere it is seen due North around local midnight. At opposition, the Sun, the Earth and the planet in question are lined up in space. A superior planet's opposition is an important time for planetary observers using telescopes, for several reasons. Firstly, the Earth is then at its closest point to the planet for the whole year. Secondly, the planet appears largest in the night sky for the whole year (i.e. it attains its greatest apparent size). Thirdly, the planet's fully illuminated side is then facing towards the Earth (i.e. the planet's phase = 100%). The full illumination, combined with the planet's large apparent size, means that the planet then shines at its greatest apparent magnitude (brightness) for the year. To the observer using only the unaided eye, a planet's brightness is its most outstanding feature when it reaches opposition; indeed, seeing a bright planet rising directly opposite the Sun after sunset is one of the highlights of the naked eye planet watcher's year. Aspects of the Superior Planets (move your pointer over the image to start the animation, or click on the image). Animation showing a complete cycle of superior planet aspects from one opposition to the next (i.e. one synodic period). The animation is viewed from a point in space above the planet's North pole (in this case Jupiter) and moves along with the planet in its orbit. The blue line indicates a fixed point in space at which the two planets are initially in alignment (i.e. at opposition). The number of days elapsed (since opposition) apply specifically to Jupiter; note that, having completed one orbit, the Earth has to orbit for a further 34 days before catching up with Jupiter for the next opposition - hence the synodic period of 399 days. The orbits are not shown to scale. Because of the eccentricity (non-circularity) of the planets' orbits, some oppositions are more favourable than others, the planets then shining brighter than at other oppositions. This is particularly true for Mars, whose orbit is quite eccentric, the result being that its distance from the Earth varies considerably from one opposition to the next (for further details, see the Mars oppositions 2012-2027 page). A planet's closest point to the Sun in its orbit is known as its perihelion, and its furthest point from the Sun is called its aphelion. Whenever a planet's opposition occurs close to - or at - its perihelion or aphelion point, it is sometimes referred to as a perihelic or aphelic opposition. Mars' best oppositions (perihelic) occur at approximately 15-year intervals when the planet is in Aquarius, oppositions taking place in August or September (this last occurred in 2018 and will next occur in 2035). Its worst oppositions (aphelic) take place in Leo (as it did in 2012). Jupiter's best oppositions take place when it is in either Pisces or Aries, when oppositions take place in September or October (this last happened in 2010 and 2011). Saturn has two best opposition times - on opposite sides of its orbit - when its rings are displayed in their full splendor. These are in Taurus or Gemini (oppositions in December-January) and in Scorpius, Ophiuchus or Sagittarius (oppositions in June-July). Saturn's last brightest opposition took place in 2017 (for more details, see the Saturn orbit page). After opposition, a superior planet becomes an 'evening star', rising before sunset. As it continues to rise earlier each day, its solar elongation - having reached a maximum of 180� at opposition - begins to reduce as it slowly closes in on the Sun. When it is 90� East of the Sun - at Eastern quadrature - the planet sets around local midnight. As it continues closing in on the Sun, the planet remains visible after sunset, but now only for a few hours. It eventually sets only a short while after sunset, before finally disappearing into the twilight and passing behind the Sun, when it again returns to superior conjunction. The planet is not visible for a couple of weeks or so on either side of superior conjunction. The yearly cycle then begins again. Unlike the inferior planets, superior planets can never show a crescent or half phase when seen from the Earth. Instead, they will either display a gibbous phase (slightly less than full) or a fully-illuminated phase (100% illuminated disk or phase = 1.0). A superior planet's least phase occurs when it is at eastern or western quadrature, i.e. at a point 90� East or West of the Sun when seen from the Earth. Mars shows the least quadrature phase illumination of the superior planets since it is the closest superior planet to the Earth. The more distant the planet, the less prominently the gibbous phase appears through the telescope; hence Mars can display a phase as little as 84% (phase = 0.84) so that it appears notably non-circular through the telescope, whilst the remaining superior planets show quadrature phases of no less than 99% (phase = 0.99) - still technically gibbous, but indistinguishable from circular in the telescopic eyepiece. 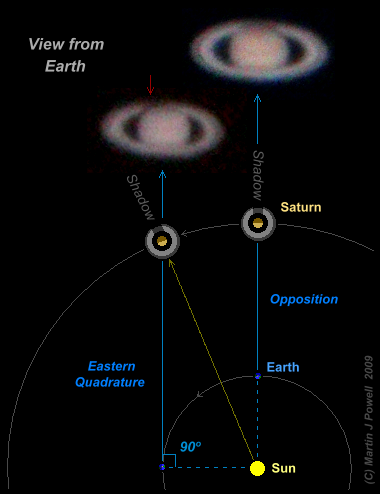 This diagram shows how the shadow of Saturn's globe on the rings can be best seen from the Earth around the time of quadrature (when the planet is 90� from the Sun when seen from the Earth). Quadrature occurs at two positions in Earth orbit: at Eastern and Western. The diagram shows the situation at Eastern quadrature. At opposition, the Sun, Earth and Saturn form a straight line in space and the shadow of the planet's rings lies in the same direction as the Earth's line-of-sight to the planet (blue line); hence no ring-shadow can be seen from the Earth at this time. At quadrature, the shadow angle falls obliquely to the Earth's line-of-sight and part of the ring-shadow becomes visible just to one side of the globe; at Eastern quadrature, the ring-shadow appears on the Eastern side of the globe (indicated by the red arrow). Saturn also appears slightly smaller at quadrature because it is then further away from the Earth. Whether the ring-shadow is visible at all from the Earth depends upon the relative tilt of Saturn's rings to the Earth at the time; this varies during the course of a Saturnian year (see diagram of Saturn's orbit). The higher the relative ring tilt, the more visible is the shadow at quadrature; hence no shadow is visible around the time of the ring-plane crossings. At Western quadrature, the situation is the same except that the ring-shadow then falls on the Western side of the planet's globe. The telescope images of Saturn are video frame captures taken by the writer in 2004. The diagram is not drawn to scale. Right: A photograph of the shadow on the rings taken by NASA's Cassini spacecraft in January 2007. Although a superior planet's quadrature may seem somewhat academic to the naked-eye observer, it is significant to the telescopic observer because this is the time at which planetary shadow events are seen at their best. Jupiter's moons are seen to be eclipsed by its shadow as they pass behind the planet; likewise, when they pass in front of the planet, the moons are seen to cast a shadow onto the Jovian disk, in an event known as a shadow transit. Saturn has its own unique shadow feature: the shadow of the planet's globe cast on to the rings by the Sun. This feature is difficult to observe from the Earth since the shadowed side of the rings always faces away from the Earth and Saturn's globe blocks it from view. However, the shadow can be partially glimpsed around the time of quadrature whenever the rings are favourably tilted in Earth's direction. Because their orbits lie outside that of the Earth, superior planets can never reach inferior conjunction (pass between the Earth and the Sun) when seen from the Earth. Likewise, inferior planets can never appear at opposition or quadrature when seen from the Earth. When the superior planets are emerging in the dawn sky (after superior conjunction) or disappearing into the dusk sky (before superior conjunction), they are subject to the same visibility problems as the inferior planets, due to the effects of twilight and the angle of the ecliptic to the local horizon. However, in the case of the superior planets, this is of lesser concern since they can be seen well at most other times of the year, and in any case they are more distant - and therefore not seen at their best - when they are in the vicinity of the Sun. The synodic periods of all the superior planets except Mars are shorter than those of the inferior planets. Mars is a special case since it is the closest superior planet to the Earth and it moves more swiftly through the night sky than the other superior planets. Indeed, Mars has the longest synodic period of all the planets - 780 days (2 years and 7 weeks) - so it is only seen at its best (around opposition) at these intervals. In between oppositions, Mars spends much of its time dim and distant, on the far side of its orbit from the Earth, loitering in the vicinity of the Sun. At these times the planet can often be difficult to distinguish from an ordinary, ruddy-colored star, shining little brighter than Polaris (the Pole star, apparent magnitude +2.0). The dramatic brightness differences of Mars over time, together with its its unique colouration and large variation in apparent size (the largest of all the planets), make it one of the more remarkable sights in the night sky. The planets are continually moving in their orbits, giving us an ever-changing variety of visual celestial events. The angular distance moved by a planet through its orbit in any given period of time depends upon the planet's distance from the Sun; the further away the planet is from the Sun, the slower the planet moves in its orbit and the less distance it is seen to move against the background stars. For example, nearby Mars moves a substantial 191� - over half of its orbit - in the course of one Earth year, Jupiter moves about 30� in a year, whilst distant Neptune moves just 2� - about four Full Moon widths - per year (the Moon itself moves Eastwards through the zodiac by about 12� per day). Consequently, some superior planets can spend several years in one constellation, whilst the faster-moving inferior planets can traverse the same constellation in only a matter of days. A complete list of the planets' mean angular motions (both daily and yearly) is shown in the Orbital Data Table below. Why do the planets appear to loop in the night sky? This animation shows how, over a period of several months, a planet appears to perform a looping motion in the night sky. The example shown is for the planet Mars, but it specifically applies to any superior planet. The planetary orbits are viewed from a point in space above the Earth's North pole, so the planets are seen to orbit the Sun in an anti-clockwise direction. The orbits are shown approximately to scale and the planets' orbital speeds in relation to one another are also approximately correct (the sizes of the circles representing the Sun and the planets, however, are not to scale). Each successive plot in the animation represents a period of about 20 Earth days. As the animation begins, Mars (as seen from the Earth) appears to be moving in an Eastward direction (i.e. direct or 'normal' motion) against the background of 'fixed' stars. The Earth, closer to the Sun and moving faster in its orbit, gradually catches up with the slower-moving Mars. As it does so, note how the line-of-sight from the Earth to Mars (the blue line) swings from one direction to the other. The result of this is that the planet first appears to stop moving (i.e. it appears stationary) and then moves backwards (retrograde) against the background stars. The Earth then 'overtakes' Mars at opposition, when the two planets are at their closest point. As the Earth continues around in its orbit, the line-of-sight swings back the other way, the planet appearing stationary again for a short while and then resuming direct motion against the stars once more. Note that the planet's apparent stationary points take place when the line-of-sight between the Earth and the planet is at the point of changing its direction. 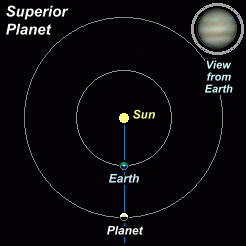 Whether the loop is prescribed in a Northward or Southward direction (in this case the latter) depends upon whether the superior planet involved is situated above or below the ecliptical plane at the time in question (for more details, see below). Also included in the animation are the inferior planets Mercury and Venus. During the period of this animation (approximately 201 Earth days) Mercury attains each of the primary configurations (inferior conjunction, greatest Western elongation, superior conjunction and greatest Eastern elongation) on two occasions (though about half of these occur out of view). Venus first appears near greatest Eastern elongation, then passes through inferior conjunction and, as the animation ends, is heading towards greatest Western elongation. This animation is also available as a single graphic and as a printer-friendly version. In both cases the plots of the inferior planets have been omitted for clarity. Because the planets move around the Sun in an anti-clockwise direction when seen from above the Earth's North Pole, all of the superior planets are seen to drift Eastwards through the zodiac at their successive oppositions. If we assume that one zodiac constellation spans 30� across (i.e. 360� / 12 constellations = 30�) we find that Jupiter appears in each successive zodiac constellation from one opposition to the next, and on average, Saturn spends two oppositions in each zodiac constellation. Mars is seen to drift one or two constellations Eastwards at successive oppositions. During the course of the year, all the planets appear to describe intricate 'loop formations' against the background stars; this is a line-of-sight effect caused by the changing relative positions of the Earth and the planets as they move at differing speeds in their orbits. 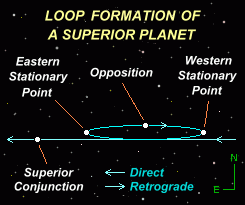 During a loop formation, the planets are seen to move direct or prograde (from West to East) and retrograde (from East to West, or 'backwards') with short periods in between when they appear stationary. A superior planet is seen to move retrograde because the Earth, being closer to the Sun and moving at a faster orbital speed, effectively 'overtakes' the superior planet, the result being that the planet appears to move backwards against the distant star background (although of course, both planets are moving in the same direction). The situation can be likened to two cars travelling in the same direction along a highway, the faster car (i.e. the Earth) overtaking the slower car (i.e. the planet). A passenger seated in the faster car sees the slower car move 'backwards' in relation to its background - although of course, both cars are moving in the same direction. Looping the Loop The diagram on the left identifies the various points in a superior planet's loop formation. The diagram on the right shows the loops and zig-zag formations that a superior planet is seen to describe. Loops are North-facing when the planet is to the North of the ecliptic and South-facing when it is to the South of it. The 'hybrid loop' form is a combination of the two; these typically occur when a planet is in the transitional stage between closed loops and zig-zags. Southern hemisphere observers, facing Northwards, will see an inverted view of these looping motions. A superior planet typically remains at its first stationary point - at the Eastern end of the loop - for several days before accelerating into the retrograde section. Half-way through the retrograde section, the planet reaches opposition, at which point - since the Earth is then closest to it - the planet moves at its fastest apparent speed of the whole loop formation. Jupiter takes about 4 months to complete its retrograde path and Saturn takes about 4� months, but Mars, being much closer to Earth, takes just 2� months. The planet then decelerates as it approaches its second (Western) stationary point, where it again 'hovers' for several days before accelerating into direct (Eastward) motion. Half-way along this Eastward stretch (i.e. half-way between successive loops) the planet passes its superior conjunction point (when it is furthest away from the Earth and dimmest for the year). Half of a superior planet's loop formation takes place when it is a 'morning star' (after superior conjunction but before opposition) and the other half when it is an 'evening star' (after opposition but before superior conjunction). All the superior planets except Mars perform one loop formation each year, Mars doing so only every couple of years. Planetary loop formations take on a variety of shapes; they can be 'closed-loops', 'zig-zag' shapes (i.e. a 'Z-shape' or 'S-curve' - effectively an 'open' loop) or a combination of the two. The exact nature of the loop depends upon whether the planet is above, below, or crossing the ecliptic at the time we observe it. 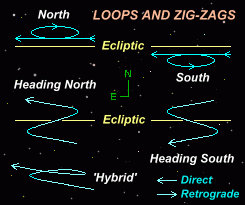 Closed loops are the most common form and zigzags are the least common, the latter only taking place at two points in the planet's orbit: when it is crossing the ecliptic heding Northwards, and on the opposite side of its orbit when it is crossing the ecliptic heading Southwards (these orbital points are technically referred to as the ascending node and the descending node). Mars's zig-zag formations take place when the planet is in Aries (planet crossing the ecliptic heading Northwards) and Libra (crossing the ecliptic heading Southwards). Jupiter zigzags when it is in Gemini (heading Northwards) and Sagittarius (heading Southwards), and Saturn zig-zags when the planet is just a little further along - on the Gemini/Cancer border (heading North) and on the Sagittarius/Capricornus border (heading South). Zig-zag formations are easy to detect for Mars since it is so close, but they can be more difficult to discern for the more distant planets, because their loops are much smaller and flatter. Martian Loop Formations, 2005 to 2010 Showing the varying shapes and sizes of Mars' looping formations over the course of three successive apparitions. Mars crossed the ecliptic heading Northwards in the 2005-6 period, tracing out a distinct zig-zag formation in South-eastern Aries. In 2007-8 the planet described a hybrid formation in Gemini, then a full Northward-facing loop in Cancer in 2009-10. In between loops, the planet completes a full circuit of the zodiac before reaching its next Eastern stationary point. The angular width of Mars' looping formations (measured between Eastern and Western stationary points) varies considerably because the planet's eccentric orbit places it at significantly differing distances from the Earth when it reaches its stationary points from one apparition to the next. Move your pointing device over the image (or click here) to see the position of the ecliptic and the angular widths of the formations. Showing Jupiter's journey through seven constellations over the course of 5� Earth years (nearly half a Jovian orbit). Positions are marked on the 1st of each month; dashed lines indicate periods of invisibility from the Earth, i.e. where the planet is too near - or passes behind - the Sun. The chart shows to good effect the changing form of the planet's loops as it moves through the zodiac; from a North-facing loop in Libra, to a hybrid in Ophiuchus, to a zigzag in Sagittarius (when the planet crosses the ecliptic heading Southwards) to hybrid again in Capricornus and finally to a South-facing loop on the Aquarius/Pisces border. Click on the image for a full-size version; a printer-friendly (greyscale) version of the chart is available here. Mars and Saturn both performed zig-zag formations from late 2005 into 2006; Mars in Aries and Saturn in Cancer. Mars last zig-zagged in 2016 (on the Libra/Scorpius border, as it moved South of the ecliptic) whilst Saturn moves slowly enough along the ecliptic to perform a few zig-zag formations in succession. Its 2006-7 zig-zag (in upper right corner of star map) was the last of three, the first having been in Gemini in 2003-4; the next one will take place in 2019, when the planet is in Sagittarius. Jupiter last zig-zagged in 2008, also in Sagittarius. The angular size of the loop described by a planet (i.e. the angular distance from Eastern to Western stationary points) depends upon its distance from the Earth; the further away the planet, the smaller its loop. Mars' loops average about 15� across, Jupiter's loops are about 10� across, Saturn's loops are about 7� across whilst remote Pluto has a loop formation of less than 3� across. The time interval between successive loops is the same as the planet's synodic period; hence Jupiter and Saturn perform their loops at intervals of just over a year, in which time they cover an overall distance in the night sky approximately equal to its mean annual motion (see the Orbital Data Table below). Mars, on the other hand, makes a complete circuit of the zodiac between loops, taking over two years (780 days) to do so. Note that the angular width of a planet's loop in the night sky is not the same angular width as its mean annual motion. The angular width of a loop is determined by two factors: firstly, the apparent shift in the planet's position against the background stars when seen from two opposite points in the Earth's orbit (an effect known as parallax) and secondly, the movement of the planet itself in its orbit. The mean annual motion of a planet, on the other hand, is determined solely by its orbital speed around the Sun, irrespective of the Earth's own motion. Uranus is an interesting case in point; the angular width of its loop (3�.9) is only a little less than its mean annual motion (4�.2), so there is only a narrow gap in between successive loops (see Path of Uranus, 2006-19). If a planet is distant enough, the angular width of its loop will exceed that of its mean annual motion, in which case the planet's looping formation will slightly overlap that of the previous year - as is the case for Neptune (see Path of Neptune, 2006-23) and Pluto (see Path of Pluto, 2006-22). To witness a superior planet performing a loop formation, one needs to observe it at regular intervals (e.g. weekly) over the course of several months, and on each occasion note down its position in relation to the surrounding 'fixed' stars. This is a rewarding way in which to learn about the movements, brightness and colours of the planets in the sky, while perhaps learning to recognise some of the constellations in the process. Although modern planetarium software will quickly and easily simulate the planets' movements in the night sky, they can somewhat take away from the primal experience of witnessing the event for oneself over a long period of time - from a planet's first appearance at dawn, through its brightest period in the night sky and its slow dance among the stars, to its eventual disappearance into the dusk. The inferior planets also describe loop and zig-zag formations against the background stars, however unlike the superior planets these formations cannot be observed with the naked-eye since they take place when they are too close to the Sun. The motions of the inferior planets are therefore somewhat academic, however since they provide a more complete picture of planetary movements in the zodiac it will be of interest to examine them closer. The diagram below shows the motion of Mercury through the zodiac over a seven-month period in the year 2023, during which time it describes two looping formations (in this case, a Southward zig-zag and a Southward loop). The primary configurations (conjunctions and elongations) take place at specific points along its path. In between loops or zig-zags, the planet has a prolonged period of direct motion, during which time superior conjunction takes place. Greatest Eastern elongation takes place whilst entering the loop, inferior conjunction takes place around the middle of the loop (when the planet is retrograding) and greatest Western elongation takes place whilst exiting the loop. Hence the inferior planets enter a loop during an evening apparition and exit a loop during a morning apparition. The morning apparition ends during the prolonged period of direct motion, the planet eventually passing behind the Sun at superior conjunction. It then re-appears in the evening sky before entering the next loop or zig-zag. 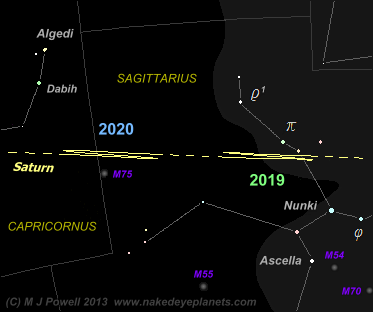 Above: The path of inferior planet Mercury through the zodiac constellations between March and October 2023, shown in relation to the plane of the ecliptic (dark yellow line). The planet is seen to move up to 4�.5 away from the ecliptic during this time. The positions at which the planet attains its major orbital configurations are marked by coloured dots (an explanation of their relative positions is given in the accompanying text). A diagram showing selected dates along the path can be seen by moving your pointing device over the image (or by clicking here). 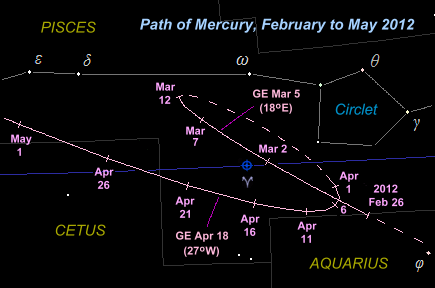 Right: The path of Mercury in South-western Pisces from February to May 2012, as it appears on the star charts on this website. In this instance the planet describes a Northward loop, as opposed to a Southward loop in the above (2023) diagram. Points of greatest elongation (GE) to East and West are indicated. The order and positions of the major orbital configurations follow those in the diagram above, i.e. entering the loop during an evening apparition, reaching greatest elongation East, passing through inferior conjunction (not marked) during retrogression and exiting the loop during a morning apparition. Sections of the path not visible to the naked-eye are shown by a dashed line. Venus moves against the background stars in much the same way as Mercury, although its loops are slightly larger in apparent width (measured from Eastern to Western stationary points) and the angular distance between loops is much greater, Venus making about 1� circuits of the zodiac in between. The order of the primary configurations - and their relative positions within the planet's path - are the same as for Mercury; namely, superior conjunction in the straight (direct) section of the path, greatest Eastern elongation as it enters the loop, inferior conjunction whilst within the loop and greatest Western elongation whilst exiting the loop before returning to superior conjunction. Because Venus has an 8-year cycle of apparitions when viewed from the Earth, its loops and zig-zags occur within specific regions of the zodiac. Since an 8-year cycle comprises ten apparitions (five in the morning and five in the evening) it follows that there are five looping/zig-zag patterns during this period, each taking place at the intersection of the evening-to-morning apparitions, i.e. around inferior conjunction. In other words, there are five periods of retrogression during the planet's 8-year cycle. .. returning to a Southward zig-zag in Taurus. These patterns drift about 3� Westwards with each 8-year cycle, such that over time they will move into neighbouring constellations (for more details regarding Venus' 8-year cycle, refer to the Venus Conjunctions and Elongations page). The formations themselves will also slowly change shape over time, depending upon the planet's position in relation to its ascending or descending node. For example, the planet's Southward loops will be wholly in Cancer from 2063 and the present hybrid formation in Sagittarius will morph into a full zig-zag after the year 2030. Like Venus, Mercury also has a repeating cycle of apparitions, although it takes place over a much longer period. Mercury apparitions repeat - to within a few days - after 46 years, a cycle which is nearly six times longer than that of Venus. Hence the motion of Mercury shown in the above diagram last took place in 1977 and will repeat in the years 2023 and 2069. Note that the inferior planets exhibit a very different motion to that of the superior planets. 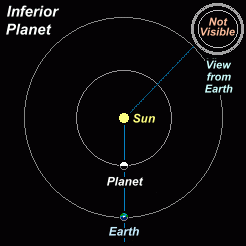 Inferior planets are mostly not seen when they undergo retrograde motion (because they are too close to the Sun). By contrast, superior planets are very visible during the retrograde stage of their loops, the entire period being easily seen with the naked-eye and when the planet is particularly bright. Superior planets do not undergo greatest elongations East or West nor do they experience inferior conjunction. Inferior planets cannot attain opposition or Western/Eastern quadrature, as superior planets do. Inferior and superior planets do have one thing in common, however: their superior conjunctions take place roughly mid-way between loops or zig-zags, the planets in question not being visible from the Earth at this time. For descriptions and images of the planets as they appear to the naked eye or with binoculars, see the accompanying article on how to identify the naked eye planets. The article also includes a visibility table for the current year, shortened ephemerides (planet position details) and accompanying star maps. To find out the general visibility times of the planets over the coming years (whether dawn, dusk, evening, etc.) refer to the Visibility of the Planets page. * One Astronomical Unit (AU) is the average distance of the Earth from the Sun during its orbit, i.e. 1 AU = 149,597,870 km or 92,955,807 statute miles. The 'AU' is normally used when calculating the positions of the planets and other Solar System bodies in their orbits. ** The synodic period is the average period of time elapsed between successive planetary aspects of the same type; opposition to opposition, inferior conjunction to inferior conjunction, etc. For example, Jupiter reaches opposition every 398.88 days, or about (398.88 - 365.25) = 33.63 days later in each successive year. A planet's synodic period differs from its sidereal period ('fixed star to fixed star') because the synodic period also takes account of the Earth's own motion through space. � The figures given here assume that the planets have perfectly circular orbits, when in fact they are slightly elliptical, so that the planets speed up and slow down slightly during the course of their orbit. The figures should therefore be taken only as a general guide when making rough calculations of planetary motions in the sky. Mean annual motions are calculated simply by dividing the planet's sidereal period into 360� (e.g. for Jupiter, 360�/11.862 years = 30�.3 per year) and mean daily motions are the annual motions divided by 365.256 days (i.e. the Earth's own sidereal period). � The minimum (faintest) and maximum (brightest) apparent magnitudes are those attained by the planets throughout the course of their orbits; hence the minimum magnitude is the faintest magnitude of the planet when it is positioned farthest from the Earth and the maximum magnitude is the brightest magnitude attained by the planet when at opposition. Saturn's minimum (faintest) magnitude applies when the rings are edge-on to the Earth; its maximum (brightest) magnitude applies when the rings are fully displayed. �� The diameters given are the planets' equatorial diameters, measured at their greatest distance from the Earth (min. angular diameter) and at their closest distance to the Earth (max. angular diameter). Useful sources of information include "Norton's 2000.0" edited by Ian Ridpath (Longman Group UK Ltd., Harlow, 1989), "Astronomy with Binoculars" by James Muirden (Faber & Faber Ltd, London, 1976), "Astronomy and the Imagination" by Norman Davidson (Routledge & Kegan Paul, London & New York, 1985) and "First Steps in Astronomy" by P. F. Burns (Ginn and Company Ltd, London, ca. 1940). The zodiac star map was based on an excellent series of diagrams featured in "Constellations: A Concise Guide in Colour" by Josef Klepe�ta and Anton�n R�kl (Paul Hamlyn, London, 1969) and "A Field Guide to the Stars and Planets" by Donald Menzel (Collins, London, 1964). The planetary looping animation was based on a diagram in "A Dictionary of Astronomy" (Pan Reference Book) edited by Valerie Illingworth (Pan Books Ltd., London, 1981) pg. 87. The commercial software 'MegaStar' (by Willmann-Bell, Inc) and the freely-downloadable SkyGazer Ephemeris by John Biondo were used to determine the dates of the planets' looping formations and other positional details. Data for the 'Orbital and Observational Data table' were obtained from "Norton's 2000.0" (see above reference) and "The Handbook of the British Astronomical Society" (BAA, London, annual publication).